We all know that cold weather and the air’s low temperature cause a lot of troubles for us. It is not only prevent us from normal activities but also lead to other fairly serious problems, including dropped humidity levels that make people feel so discomfort as well as affect our health in a negative way. And in that case, humidifiers always come to our mind as a great solution to deal with such an uncomfortable situation. I can say that this kind of product is pretty important in our lives, especially in the winter, as it helps protect our health from some threats of nose, throat discomfort, sleep losing…, and even flu and diseases caused by viruses, which might result from too dried air. 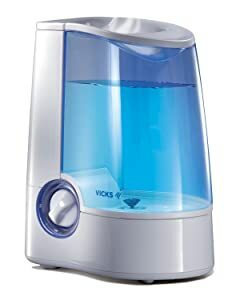 If you are looking for a humidifier for your home, let’s take a look at this writing because I am about to make some reviews related to Vicks Warm Mist Humidifier which is considered as a pretty good choice for many people among lots of other same line products available in the market now. And who knows, it can also be a good choice for you as well. Now, it’s the time for us to start figuring out the both sides of it, and see if it’s really worth to invest in or not!!! Because water is fully boiled before releasing steam into the air, the moisture in your room is so warm, clean and pure that is up to 95% free from harmful bacteria. By that way, your body seems to be so safe from cough, congestion, flu, fever, viruses and other diseases during cold and dry weather. As compared to other humidifiers models appearing on the market now, this appliance from Vicks runs so smoothly without much noise, allowing users to feel comfortable, not be disturbed as well as easy to fall asleep when it operates. This automatic function enables the humidifier to be always safe for users during operating process. This humidifier’s tank is able to contain up to 1 gallon of water, allowing the machine to work continuously for 24 hours without any refilling. That’s so convenient for us, right??? In this model of V750 Warm Mist Humidifier from Vicks, users can easily add VapoSteam or VapoPads to create healthy soothing vapors, thanks to its included scent pad slot. This additional product can help strengthen your body, and relieve respiratory irritations associated with a cold. It’s a common cons of all warm mist humidifiers as minerals and ions from boiled water tends to build up and accumulate on the item’s heating plate, so, requires users to periodically clean it. Furthermore, some experts also warn users to not use the warm mist humidifiers, including V750 from Vicks, near children as their curious hands somehow can tip over the vaporizer filled with boiling and very hot water. People who have asthma should not use this kind of humidifiers because of the effects of hot and warm mist on the patient’s sensitive breathing passages which are likely to cause some irritations. While many people feel so great as having the Vicks Warm Mist Humidifier, there are still some others disappoint and complaint about the product’s quality after purchasing it. Particularly, the appearance of breakdowns and leakage on the item just after some times of using is seemed as 2 common downsides that are reported by some item owners. Here are some reviews on the Vicks Warm Mist Humidifier that I want to share with you in this article. As you can see, besides great benefits it brings out to the users, there’re still some products’ drawbacks that you should consider before making final buying decision. In the end, I really hope that all of those things listed above have provided to you useful and important facts related to this item.